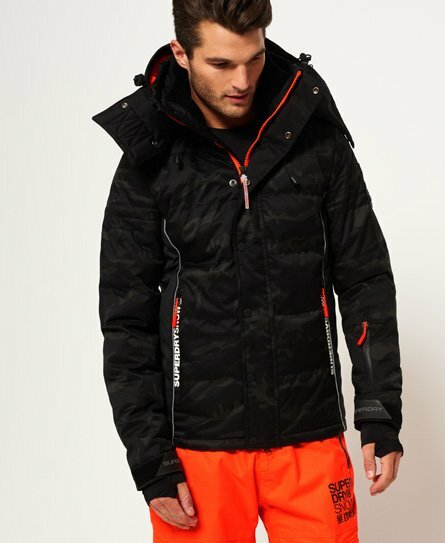 Superdry men’s Snow puffer jacket from the Superdry Snow collection. This padded snow proof jacket complete with an inner ribbed collar, a detachable hood that has taped seams to help keep the moisture out , a double-layer zip with popper fastening and a zipped ski pass holder. The Snow puffer jacket also features two outer fleece lined zipped pockets, two inner pockets including a tech pocket with earphone routing and a detachable goggle cloth. Inside the puffer jacket there is a removable snow skirt and snow cuffs to help keep the powder out and the warm in. The jacket is finished with Superdry branding on the sleeve and pockets.